Mr. Bush demonstrates a mastery of pattern mixing that would make the Duke of Windsor proud: microcheck sport coat, plaid button down shirt, striped wool tie, and silk paisley pocket square. Neutral grey flannels below harmonize with everything. It’s a real pleasure for us to work with a client like Russell Bush — an interior decorator whose own taste level and refinement inspired one of his clients to describe him as “an artist of spaces.” Mr. Bush’s exacting standards are a challenge we’re proud to meet (and hopefully exceed). Please describe your sartorial aesthetic. What has influenced and inspired it? How has it changed over the years? I have always liked to dress in what I consider to be an updated classic way, informed by the past but with a nod to current fashion. When I worked as a fashion designer in my youth, I made a lot of my own clothes which were unique and always attracted attention and comments. Now that I am older, I still like to dress in a somewhat distinctive way but more subtly, in a way that pleases me but does not make me the center of attention anymore. I am influenced by and love the clothes of the first half of the 20th century but do not want to appear as if I am dressing in a period way. Or look too dandified, though I do enjoy seeing this in others when done with great flair. My taste has always gravitated to a more European look rather than what is considered typically American. Mr. Bush in his appropriately named Russell plaid sport coat with hacking details, lapped seam trousers, button down shirt, and silk accessories. The elegantly elongated Russell plaid was a favorite of menswear scribe George Frazier but is rarely seen today. Do you feel it's important to wear tailored clothing in your professional context? What do you think it conveys? Yes and no. In a world which seems to have adopted dress-down-Fridays as dress-down-everyday, it is very easy to feel overdressed when meeting with a client that might have just come in from the gym and doesn’t think it necessary to change before a meeting with his decorator. I don’t think it good form to one-up a client sartorially or otherwise. On the other hand, one of my clients particularly commented on how I was dressed. She noticed that I was wearing a particularly unexpected combination of patterns and fabrics so she knew that if I could pull that combination off, I could definitely put a house together in an amazing way. Another client recently commented about my beautiful Flusser jacket. She not only noticed the fit, but that the pattern aligned perfectly everywhere. I was pleasantly surprised that she would notice this, and after working with her for a number of years, I saw her in a different light - that she was actually aware of such detail that I did not think her capable of noticing. For me work attire most always includes a blazer or tailored jacket (I need the pockets), dress trousers, open neck shirt (with or without a neckerchief, seldom a tie - though I own a zillion trillion of them and keep buying them!). Or I wear a suit with a more casual edge. I wear turtlenecks in winter, always have and always will. I frequently leave the jacket behind in the peak of summer, especially when I find myself having to run around town on a boiling hot day. I love having an excuse to wear a dressy suit and tie to an opening or to dinner with an elegant lady, but I find more and more that I am usually in the minority and sometimes feel self-conscious. I usually remain in my daytime clothes at home at night, minus the jacket. I am comfortable in them and do not feel the need to change. When I do finally get out of them, I wear a Japanese kimono and Chinese straw slippers, comfortable in all seasons and a holdover from my youth. On weekends in town, I don’t really dress any differently from my weekday attire. During summer in the country, light stone colored chinos (shorts or long trousers depending on the weather) with pressed cotton shirts with rolled up sleeves, driving shoes. In winter, corduroys or dark, unwashed jeans with those cotton shirts and a sweater, leather shoes; quilted Barbour jackets (or a parka in the dead of winter). I love an excuse to wear a blazer or dressier jacket if the occasion permits. What was the reason you initially came to Alan Flusser Custom, and why have you continued to have clothes made here? What do you think our brand stands for? Though the Duchess of Windsor quipped “If you are tired of shopping you are shopping in the wrong shops”, I came because I truly was tired of shopping in a market that is flooded with more and more stores, with trendiness and with inconsistent cut which, for the most part, I did not find flattering to my body type. Alan understands elegance, personal style and what makes any man look his best. He is one of the few that I would trust to talk with on matters of great style. I have always enjoyed Alan’s point of view which I was first exposed to in his books. Though I have always considered myself an informed dresser, the experience of working with Alan is taking me to a new level of refinement. It has been an experience that I find very inspiring and exciting…and fun! As I have grown older, the insecurity of dressing in a too youthful way for my age has reared its ugly head. It has been very rewarding to know that, after a trial bump with trendy short jackets and skinny pants, I am back on track with what proportions look best on my body type, confirmed by a man with an expert eye. 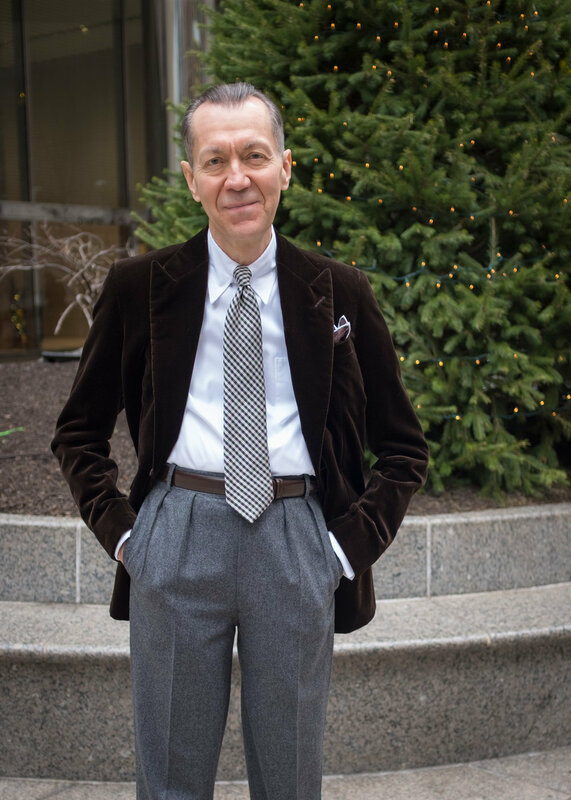 Alan Fusser stands for quality and, perhaps even more importantly, truly knows great style when he sees it and supports it. Mr. Bush’s silk shepherd-check tie and hand-rolled linen pocket square perfectly integrate a rich chocolate velvet jacket, grey flannel trousers, and a white tab collar shirt. A patch-pocketed Black Watch plaid jacket has become Mr. Bush’s go-to Flusser jacket this winter. Playing with colors, textures and patterns. As many together as aesthetically possible. Sometimes subtle combos, sometimes a bit jazzier, depending on my mood and where I expect to find myself on any given day. I enjoy wearing more color now, less black than I used to. For the most part, greys have now replaced black in my closet. I love fabrics so I am planning to start wearing ties a bit more again. Always enjoy having more to play with. In what ways do you feel your clothes express your personality? In all ways. It is why I enjoy them so much. I dress to complement my mood or for an occasion. My days in town are so full that I frequently go from morning to night in the same clothing. Habitually, I cannot get dressed in the morning without knowing the weather forecast, most specifically the temperature. I first choose a jacket or suit and carry on from there. Sometimes, I start with a shirt. Another motto (though not Elsie’s): “To thine own self be true”. Seems obvious, but to those who do not already have one, get a good full length mirror. Consult it often. Amazing what can go unnoticed from the waist down. Even better if one can manage to have a three way mirror, to check on the back also! Special thanks to Mr. Russell Bush for participating!